Dr. Fisher’s laboratory focuses on understanding the molecular and biochemical basis of cancer development and progression, and utilizes this accrued knowledge to improve treatments for all types and stages of cancer, including the ultimate stage – metastasis. When cancer metastasizes – or spreads to sites remote from the primary tumor to new target sites – treatment becomes more difficult and, in many instances, ineffective. Dr. Fisher’s experiments are designed to mechanistically understand tumor development, and he and his team have developed innovative approaches to identifying genes of relevance in the carcinogenic process. For example, they identified one in 1996 (prior to NFCR funding). when they reported, for the first time, how the gene mda-9/syntenin switches on an important signaling protein that results in increased cancer cell motility, invasion and metastasis. Dr. Fisher has also created a new therapeutic approach to cancer therapy, which he calls a Cancer Terminator Virus (CTV.) As a genetically reprogrammed virus, CTV infects and destroys tumor cells while leaving normal cells alone. The Fisher team also engineered a CTV capable of producing a tumor-killing molecule – interferon gamma (IFNγ). As a natural product of our immune system, IFNγ can kill tumor cells both directly and indirectly by eliciting immune responses. This happens at the primary tumor and metastatic sites. CTV could be a potential treatment for early stage and metastatic prostate cancer, and recently, studies have been expanded to test its pancreatic cancer treatment potential. Additionally, Dr. Fisher and his team have developed the first sensitive and specific imaging agent for bone metastases, which are the greatest cause of fatalities in prostate and other cancers. The molecular imaging technique detects cells that express a gene called AEG-1 – which was originally discovered by Dr. Fisher. The gene has high levels of expression in all of the cancer types investigated so far, with limited expression in normal tissues. The results when using the new imaging technique were more conclusive than usual and can lead to great improvements in clinical imaging overall. Research at Dr. Fisher’s laboratory is also combining selective cancer imaging with the targeted delivery of a therapeutic, a process termed “theranostics.” These imaging improvements and combinations may lead to earlier detection and treatment for metastases. Most recently, Dr. Fisher has been collaborating with another NFCR-funded scientist, Dr. Web Cavenee, on a new pharmacological agent to treat glioblastoma multiforme (GBM), the deadliest form of brain cancer. This agent could, with additional chemistry, lead to a new drug to prevent radiation-induced invasion of GBM cells. The researchers have tested the agent in combination with radiation and have seen profound survival benefits in pre-clinical models. Paul Fisher, M.Ph., Ph.D., received his Bachelor’s degree from Hunter College and his Master’s from Lehman College. He went on to get his M.Ph. (Master of Public Health) and Ph.D. from Rutgers University, where he was also a postdoctoral fellow. Dr. Fisher later conducted research at Albert Einstein College of Medicine and at Columbia University, where he became a Professor of Clinical Pathology, the Director of Neuro-Oncology Research and the Michael and Stella Chernow Urological Cancer Research Scientist. Dr. Fisher joined the faculty of the Virginia Commonwealth University’s (VCU) School of Medicine in 2008 and is currently a Professor and Chairman in the Department of Human and Molecular Genetics, Director of the VCU Institute of Molecular Medicine and holds the Thelma Newmeyer Corman Chair of Cancer Research in the VCU Massey Cancer Center. In addition to his NFCR award, Dr. Fisher is a visiting research professor, eminent research scholar and adjunct professor at New York University, and a visiting professor at Burnham Institute for Medical Research. 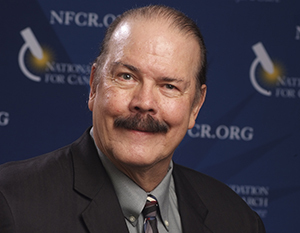 Dr. Fisher won the CaP CURE Award for Prostate Cancer Research in 1995 and the Lustgarten Award in 2003, 2004 and 2005. More recently, Governor Terry McAuliffe recognized Dr. Fisher as Virginia’s Outstanding Scientist of 2014. In 2018, Dr. Fisher was invited to join the new, illustrious editorial board of the Journal of the National Cancer Institute (JNCI) and JNCI Spectrum. Your ticket for the: Paul Fisher, M.Ph., Ph.D.